WASHINGTON — The forward-leaning technology arm of the U.S. Defense Department is betting that in just a few years, the business of sending robots to high orbit to repair and refresh satellites will be so successful that the government and the industry should now begin to discuss rules and protocols. “We need to work on a set of rules,” Defense Advanced Research Projects Agency Program Manager Todd Master told SpaceNews. DARPA recently launched a “Consortium for Execution of Rendezvous and Servicing Operations” to start bringing the industry to the table. The agency is hoping all major industry players will join the group, including geosynchronous satellite operators and the handful of firms preparing to offer in-orbit robotic servicing of satellites. This effort has been years in the making. DARPA pioneered the concept of using robots for in-space repairs and more recently invested millions of dollars in a public-private partnership with Space Systems Loral to build an autonomous vehicle for servicing satellites 36,000 kilometers above Earth. Master said the lack of clear, widely accepted technical and safety standards for the performance of on-orbit activities involving commercial satellites remains a major obstacle to the expansion of the industry. The federal government has set up regulatory bodies for space operations — the Federal Aviation Administration runs launch, the Federal Communications Commission oversees satellite communications, the National Oceanic and Atmospheric Administration regulates Earth imaging. But there is no rule-making body for the new and mostly unknown activity of in-orbit services. “How do we ensure this is conducted in a safe and responsible fashion?” Master asked. The consortium, he said, will be expected to adopt a set of nonbinding rules that the industry will voluntarily agree to comply with. Companies have financial incentives to do this, he said. “They want to give confidence to investors and insurers and customers that they are doing things safely.” DARPA will oversee geosynchronous satellite work and let NASA handle low-Earth orbit projects. 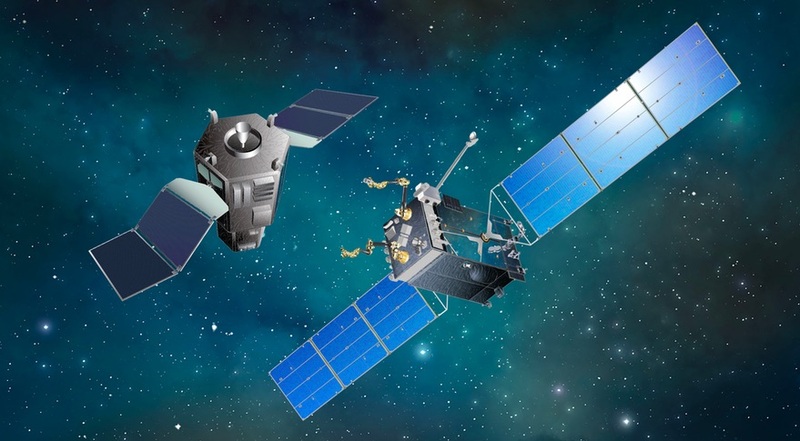 DARPA is moving to create the rule-making consortium following a six-month legal battle after its decision to team up with Space Systems Loral for the program known as “robotic servicing of geosynchronous satellites,” or RSGS. The agency set out to select a partner in November 2016, start bus payload assembly and testing by 2019, proceed to bus and payload integration by 2020 and launch a vehicle by March 2021 for a nine-month deployment. The project was delayed by several months after the selection of Space Systems Loral was protested in February by Orbital ATK, a company that already had invested in in-orbit robotic technology and is in the process of building a servicing vehicle. Orbital argued that DARPA was in violation of a National Space Policy provision that says the government should not invest in systems that compete with commercial products. Orbital ATK in September announced “significant progress” on its in-space satellite servicing system. Called the mission extension vehicle, or MEV, it is now in production, according to a company news release, with about 75 percent of the platform and payload components already at the manufacturing plant in Dulles, Virginia. The spacecraft will begin system-level testing in spring 2018 and launch planned late next year. The MEV-1 will provide satellite life extension services to its anchor customer, global fleet operator Intelsat, beginning in early 2019. Orbital said its goal is to produce a fleet of in-orbit servicing vehicles for repair, assembly, refueling and in-space transportation. Outside the United States, companies that are getting into the game include Airbus, which has teamed with a U.K. company, Effective Space Solutions. Foreign space agencies have contacted DARPA about joining the consortium, said Master. “We are still trying to figure out how to engage foreign governments.” As far as foreign companies are concerned, “We welcome their participation. This is meant to be a commercial consortium” and many key players are non-U.S. firms. DARPA in the meantime is counting on a big payoff from its investment in the RSGS. When Space Systems Loral completes its first robotic vehicle, it will be required under its agreement with DARPA to service government-owned satellites before it starts commercializing the work. 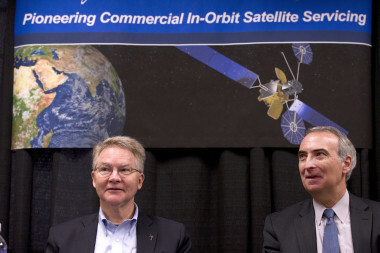 Agency officials in briefings to contractors have been vocal about their ambitions to help make in-orbit servicing of satellites a viable industry. They envision satellite companies using robots not only to fix broken components but also to upgrade the capabilities of spacecraft by inserting fresh electronics. The service vehicles with robotic arms would be similar to those used to build the International Space Station but would have more sophisticated levels of autonomy and safety. DARPA is trying to make the industry more comfortable with the idea of servicing satellites in orbit and keeping them in business years longer than projected, potentially saving hundreds of millions of dollars over time. He said the consortium is getting off the ground right in time to prepare for a surge in satellites over the coming decades. There are today about 1,500 functioning satellites in orbit, and thousands more will be launched in the years ahead. DARPA selected a contractor, Advanced Technology International, based in Summerville, South Carolina, to manage the consortium.